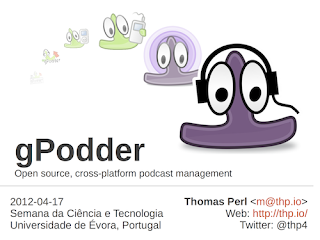 On Tuesday, I've given a talk about the history and development methodology of and in the gPodder project at the Science and Technology Week in Evora, Portugal. You can find more details on the talk page or take a look at the slides. The target audience for this talk were students who want to get involved in open source development, and who know about the general development topics, but want to know more about what infrastructure and content is needed to maintain a proper open source project. I've been doing talks about gPodder from different perspectives since 2008, the next one will be at the Tizen Conference 2012 in San Francisco - with focus on mobile development and the web service. If you want me to give a talk about open source development at your event, company or meetup, drop me a line and I'll see what I can do for you.